Kiki Bertens celebrates her win. DUTCH challenger Kiki Bertens profited from a third-set collapse from Simona Halep to score the biggest win of her career, beating the world No.1 2-6 7-6 (8-6) 6-2 in the Cincinnati Open final. Halep, who won the Montreal trophy a week ago and came into the final on a nine-match winning streak, ran out of reserves and was unable to stop Bertens' momentum. 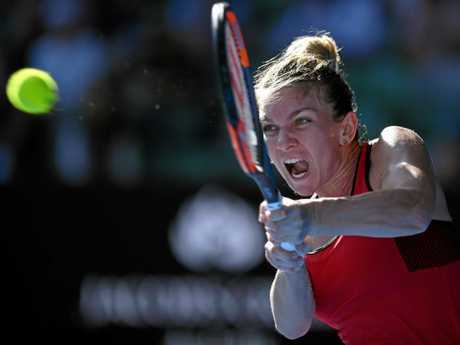 "I've lost three finals here, but maybe I will able to win one at this tournament because I love to play here," said Halep, who fell to Serena Williams in the 2015 final of the hardcourt US Open tune-up and to Garbine Muguruza in the title match last year. "Hopefully we can play many more matches like this in the future," said Bertens, who claimed a sixth career WTA title. Bertens saved a match point in the second-set tiebreaker to stay alive. Halep had looked like ending a quick afternoon with a victory after breaking Bertens twice to sweep the first set. Halep seriously faded in the final set, going down two breaks to trail 1-4. Bertens kept up the pressure and advanced with a winner on her first match point, posting her second career win over Hale six years after beating her for the first time.